The following conditions here state the rights, obligations, and responsibilities of all parties involved in this Agreement. In places where the words 'you' or 'your' appear, they refer to the Customer. The words 'we', 'us' or 'our' signifies Handy Cleaners. The present terms and conditions can be changed and/or amended without prior notice. Your attention is drawn to our cancellation policy described in Clause 4. 1.1 Please check that the details in these Terms and on the Order Confirmation are complete and accurate before you commit yourself to the contract. If you think that there is a mistake, please make sure that you ask us to confirm any changes in writing, as we only accept responsibility for statements and representations made in writing. 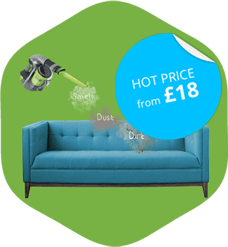 Handy Cleaners is a trading name of Amazing Home Services Ltd, Registered in England & Wales, Reg No. 11147084. Registered office address of the company is 4 Kelvin Court, Spencer Road, London, United Kingdom, W4 3SX. 2.1 At the time of the booking you have to provide us with an accurate description of your property to include the number of bedrooms, bathrooms, etc. Handy Cleaners. reserves the right to amend the quote and charge for any extra work that needs to be carried out. (a) In the event of our cleaners being unable to obtain access to the property due to lack of keys, lockout or no one being present you will be subject to the minimum charge of 50 GBP. 3.2 The Services provided by Handy Cleaners. are payable in cash to our operatives on site, or by card over the phone at the beginning of the service. We do not accept cheques. 3.4 Additional charges may include: congestion charge of 11.5 GBP or an additional charge (based on distance) if your property is outside of M25. 4.3 Cancellations can only be made over the phone or e-mail. Voicemails are not a valid option for re-schedulling and/or cancellations. 5.1 In order to provide professional and quality service, our teams must have adequate lighting and warm water available at the property. In instances where the health or wellbeing of our teams is threatened, due to hazardous environment, Handy Cleaners, reserves the right to cancel the appointment. 5.3 We require that you (or representative) are present at the end of the cleaning in order to inspect the Services and sign off the work as completed to your satisfaction. In the event that you are not present, the Services will be treated as accepted by you. (g) Washing and stacking of dirty utensils, glassware, cutlery, crockery, pots is offered at additional cost of 20 GBP. In the unlikely event that the Services do not conform to these Terms, please let us know IN WRITING within 48 hours of the completion of the job. We will re-perform the Services free of charge. *This is only applicable to the End/Pre of Tenancy Cleaning service. (a) Handy Cleaners. will perform re-cleans only for customers who have provided and inventory report and pictures, 48 hours after the completion of the service. Re-clean policy, and 48 hour guaranteed service is only applicable for End/Pre of Tenancy Cleanings. (c) A re-clean policy can and will only take effect when a payment for the initial service has been made. (c) Carpets will be slightly damp straight after the clean. Estimated drying time may vary depending on the nature/fabric of the carpet. We expect drying process to last between a few hours and a day. Please, be advised that by providing a good ventilation or heating, the drying time can be decreased. Handy Cleaners. will not be held responsible for any damage, or discolouring caused by placing heavy items on the carpets shortly after they have been cleaned. (b) Handy Cleaners is not responsible for any penalty issued in case the occupant fails to resolve this matter in advance. (f) the service is incomplete due to obstructed access to clean under heavy furniture such as heavy furniture, such as freezers or american fridge-freezers, etc. (g) curtain shrinkage during a curtain steam cleaning. Please note: Handy Cleaners. aim to deal with any issues with the service provided as soon as possible. Therefore any complaint filed later than 7 working days (from the date the service provided) will NOT be dealt with. The terms and conditions summarised below, and on other Handy Cleaners documents, outline the way in which you may use our website handycleaners.com (our site) and related services. The terms are relevant for all users, customers and guests. It is imperative that you read and understand these terms before continuing to our website. By entering our site you confirm that you have read our terms and conditions and that you will adhere to the stipulations outlined within them. Anyone who does not agree with our terms and conditions should cease to use our site with immediate effect. Handy Cleaners (We) is in complete control of handycleaners.com. We operate from the following address: 53A Bollo Lane. 1.1 Our site is accessible on a temporary basis and can be amended at any time without any prior notice. We do not guarantee that our site will be available on an ongoing basis. We do not accept responsibility for any problems arising from site inaccessibility. 1.2 We reserve the right to limit access to our site at any time. This restriction can be extended to guest users and registered accounts. 1.3 All security information should be treated in a confidential manner. This includes passwords, user names and any other security-related information that has been set up by yourself or allocated to you by the site. We retain the right to inactivate your account, password or user name if it is deemed that you have not abided by our terms and conditions. 2.1 We act as an introductory agent for cleaning companies and provide links between them and you. We have permission to take bookings for them. To do this, we will ask you to provide us with relevant booking information which we will then pass on to a suitable service provider (Provider). You will then receive an email confirmation containing details of your booking and a link to our Services Terms and Conditions. 2.2 A contract between you and the Provider will only exist once you have agreed to the Services Terms and Conditions. 2.3 The Provider is completely responsible for the services carried out. The provisos outlined in the Services Terms and Conditions are legally binding; you should ensure that you fully comprehend the terms before agreeing to them. 2.4 All contact relating to your service provision should be carried out through us and not through your Provider. All card, cheque and bank transfer payments will be processed by us. 2.5 We do not take responsibility for the service provision. While we take every feasible step to ensure that our Providers are suitable, they are completely responsible for the service provision. By agreeing to our terms and conditions you accept that we cannot be held responsible for their actions. 2.6 While we are not responsible for the actions of service providers, we do accept feedback about your experiences with them. You can contact us on 020 3743 0505. 3.1 Unless otherwise stated, we are the sole owner of the site’s intellectual property rights. The material on our site is protected by copyright laws. All intellectual property rights are reserved. 3.2 You may download, copy or print material from our site for personal use. You can also encourage others to read the material on our site. 3.3 You are not permitted to amend any of the material which you have downloaded or printed from our site. Images, videos, graphics and audio files should not be used out of context and should always be used with the associated text. 3.4 You should always identify us, and any other noted contributors, as the owners and providers of information which you have used from our site. 3.5 We do not permit you to use any information from our site from business purposes. If you want to use information for such reasons, you must obtain appropriate permission from our licensors. 3.6 If you do not adhere to our intellectual property rights, we will remove your right to use our site. We also reserve the right to destroy any material which you have used in breach of our terms and conditions. 3.7 handycleaners.com is trademark of Handy Cleaners. 4.1 You should not rely on commentary and other materials contained on our site as a source of advice. 4.2 We cannot be held responsible for the incorrect use of information from our site. 5.1 We reserve the right to update information contained on our site without any prior notice. We may also terminate access to our site at any point in time. 5.2 We are not obliged to update information on our site. Information contained on our site may therefore be out of date. 6.1.1 The voiding of warranties and other conditions which may otherwise have been in place. 6.1.2.7 the ineffective use of time by office staff or management personnel. This includes contract breaches, carelessness and civil wrongdoings i.e. tort. 6.2 This does not affect our liability for any bereavements or injuries resulting from negligence on our part. We also accept responsibility for any falsification of information and all other liabilities which we are legally required to. 8.1 Any information that is uploaded or added to our site must be in adherence to our terms. This includes uploaded files, comments made and any contact made with other site users. It is your responsibility to ensure that information uploaded adheres to our terms; we therefore, take no responsibility for any information uploaded which does not comply with our terms. 8.2 We retain the right to use any information uploaded to our site in a non-confidential manner. This means that your information may be duplicated, dispersed and released to other parties as we see fit. We may also reveal your personal details to any other company or individual person who claims that information you have posted is in breach of their privacy or intellectual property rights. 8.3 We do not accept responsibility for any information that is uploaded by a site user. This includes its accuracy and subject matter. 8.4 Any information which you upload to our site can be removed if it is not in accordance with our terms and conditions. 9.1 Unless otherwise agreed, you are not permitted to access our site or any information, databases or technology connected to it. Introducing viruses or other malicious software is also in breach of our conditions, as is damaging our site through any other form of service attack. 9.2 If you do breach our security guidelines we will seek to prosecute you via the Computer Misuse Act 1990. In doing so, we will pass your personal information to the police and you will no longer be permitted to access our site. 9.3 We do not take responsibility for any damage which you incur as a result of viruses or malicious attacks originating from our site or from any other sites linked to it. This includes damage or losses to your hardware, software or any other information stored in relevant files or databases. 10.1 We do permit you to set up links to our home page providing the link does not infer any sort of alliance or testimonial to your site. The link should not be made in such a way as to harm, or benefit from, our status and should only be done so in a reasonable and legal manner. 10.2 Links to our site should only be set up on websites which you own and are in control of. 10.3 If you setting up a link to our website, you must ensure that your site is operating in complete adherence with our content terms and conditions. You must also ensure that you do not frame our website or set up any link other than to our home page. We can decide to forbid all links to our site at any time without prior notice. 10.4 You must not use any information or set up any links to our site outside of these terms and conditions. If you would like to do so, please contact us via the following email address: [email protected]. 11.1 Links to other sites or documents on our site should be used for information purposes only. 11.2 We do not accept responsibility for the content of any site or documents which are linked to our site. This includes any damages or losses to hardware, software or information. 12.1 Our site is under the non-exclusive jurisdiction of English courts and any concerns will be deals with in accordance with English law. We are also permitted to pursue convictions in other appropriate countries where a breach of terms may have been made. 12.2 Any convictions, investigations or claims relating to our terms and conditions will be dealt with in accord with British law. 13.1 All of your data collected during the process of your quotation or/and during the chosen service will be stored safely and securely and will not be shared with anyone. 13.2 We will not use your email address to send you any advertising emails or promotions unless you have subscribed to our form. 13.3 You can at anytime request to unsubscribe and therefore will not receive any emails from us once you have unsubscribed. 13.4 You will continue receiving important emails such as quotations, amended quotation, confirmation and amended confirmation as well. 13.5 Your data will be stored for 36 months and will be automatically deleted once the period of time has passed unless you have chosen to use our services once again during that time. 13.6 You can at any time request to obtain the data that we have stored for yourself and we shall present it to you in 15 business days. 13.7 You can contact us at any time to request additional information or to file a complaint regarding your data. If you would like to raise any concerns about our site, or information contained on it, contact our customer services team on [email protected]. We would like to thank all users and visitors for taking the time to appreciate our site. Please note that we do not take any liability for news stories contained on handycleaners.com. News stories are updated automatically by an rss feed and are in no way a reflection of our business or services.